Photographs of, and candid interviews with, soldiers of the Iraq War, documenting the extraordinary challenges they face. Given extraordinary access by the U.S. Army, Barry Goldstein spent two years photographing and interviewing more than fifty actively serving members of a veteran battalion, including two month-long trips during which he lived and patrolled with the unit. No one indicts war more powerfully than experienced professional soldiers, and no one enumerates more eloquently the reasons for serving. 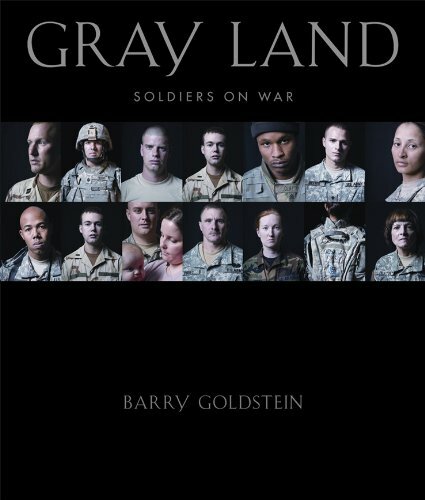 Gray Land is a collection of photographic portraits of veterans accompanied by excerpts from candid, unsupervised interviews and images documenting the realities of life in a war zone. The nobility and wisdom of these men and women will change the way we see war.